After a hard day of work you come into your kitchen to make a cup of coffee, and there’s a bat flying around. You enter your bathroom and there’s a bat in the toilet. You are leaving for work and there’s a bat in the snow on your front porch. What do you do? 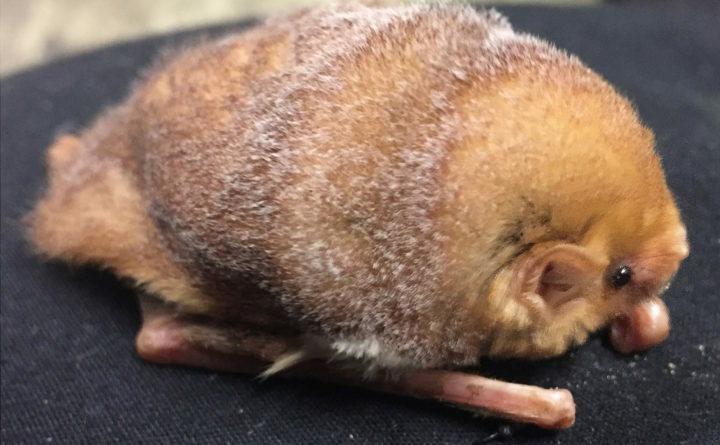 Bats should be hibernating in winter and many people have Big Brown Bats in their attics sleeping the cold weather away, unknown to the human occupants of the houses. But occasionally something disturbs them and they are in real danger of freezing or starving to death. Just by waking up and flying, they lose 2/3 of the winter fat that they have stored up to live on until spring. They end up in places, like kitchen sinks, where they don’t want to be. You probably don’t want them there either. Call Acadia Wildlife Center in Bar Harbor at 207-288-4960 for advice and help. Don’t, please, put them out in the cold where they won’t survive. Rabid bats are very rare, about as rare as rabid dogs or raccoons. Capturing bats safely can be easy. Don’t try and catch them when they are flying, but watch and see where they land. Use a glove, or a dishtowel; have a small almost airtight cardboard box ready; pick them up with the glove and put them in the box with a cloth to keep them cozy. Tape it shut. At this point they need to be kept warm so put it high on a shelf and call us. Don’t even think about giving them food or water. This only increases your interaction with them, thus your chances of a possible rabies exposure. Feeding them is tricky business, that’s what they pay us the big bucks for. Don’t ever let your child touch them. We have volunteers in Bangor, so even if you don’t have transportation, you can help the bat. The only exception to this is if a bat is flying in a room where you or a child is sleeping, and could have bitten you as you slept. Then a warden should be contacted and the bat tested for rabies, just to be safe. Afraid of bats? They weigh about as much as a silver dollar. They have sharp teeth, like your cat but a lot smaller and those teeth are good because they eat thousands of the bugs that destroy our trees, crops, and outdoor parties. But they swoop at me! Like a woodpecker, they must fall from a height to gain enough lift to fly. They are way more afraid of you, than you are of them and unless you look like a huge mosquito, they aren’t interested in interacting with you, landing on your head, or playing with your hair. They have bigger problems. Three of our Maine species of bats are on the endangered species list; the rest may follow. Please help them. They are beautiful, as clean as your cat, as smart as a dolphin, wonderful parents, live for 35 years, and they can fly- how cool is that! Don’t be afraid. Of all the wildlife in our world, bats collectively are the most useful neighbors that we have, and they are in real trouble and need us to care. Each one saved is vital.